Bay Area - I Say Ding Dong Shop - Buy Stickers, Decals & Unique Automobilia. Bay Area Auto & Cycle Scrutineers Shield Stickers. 1950 - 1953. Set of 4. 2". 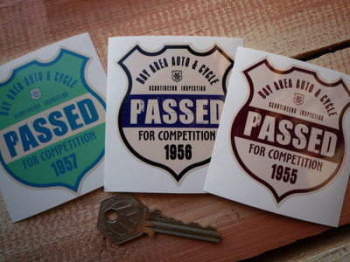 Bay Area Auto & Cycle Scrutineers Shield Stickers. 1954 - 1957. Set of 4. 2". Bay Area Auto & Cycle Scrutineers Stickers. 1958 - 1961. Set of 4. 2". Bay Area Auto & Cycle Scrutineers Stickers. 1963 - 1966. Set of 4. 2". Bay Area Auto & Cycle Scrutineers Stickers. 1967 - 1970. Set of 4. 2". Bay Area Auto & Cycle Scrutineers Stickers. 1971 - 1974. Set of 4. 2". Bay Area Auto & Cycle Scrutineers Stickers. 1975 - 1978. Set of 4. 2". Bay Area Auto & Cycle Scrutineers Stickers. 1979 - 1982. Set of 4. 2". Bay Area Auto & Cycle Scrutineers Stickers. 1983 - 1986. Set of 4. 2". Bay Area Auto & Cycle Scrutineers Stickers. 1987 - 1990. Set of 4. 2". Bay Area Auto & Cycle Scrutineers Stickers. 1991 - 1994. Set of 4. 2". Bay Area Scrutineer Shield Passed For Competition Sticker. 2.5". Bay Area Scrutineers Various Years Hot Rod Auto & Cycle Sticker. 3".